Parenthood is one giant adventure, isn’t it?! 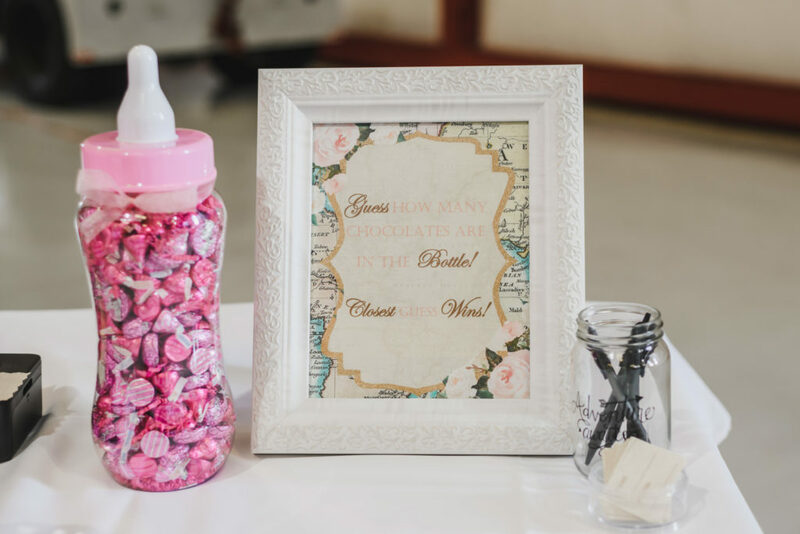 That’s why I absolutely love this stunning Greatest Adventure themed baby shower! 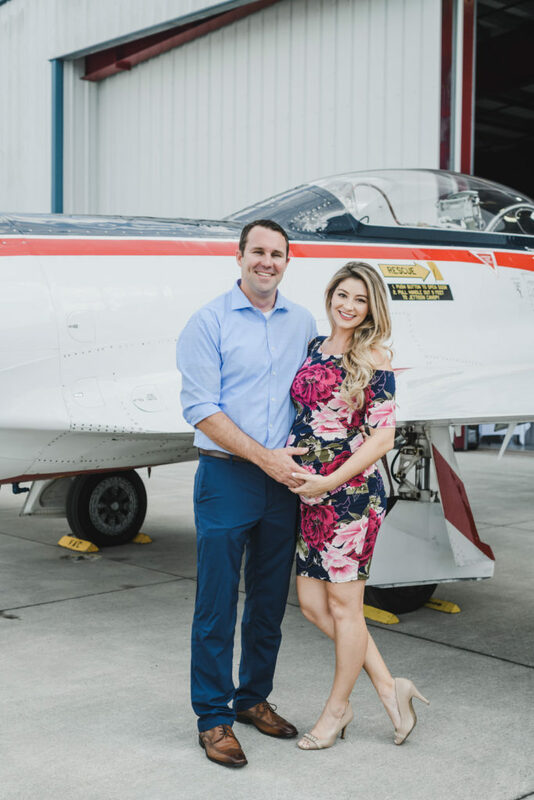 Parents to be, Laura and Jeff, have explored over 100 countries together, so a travel themed baby shower was the perfect way to celebrate the arrival of their first child with family and friends. 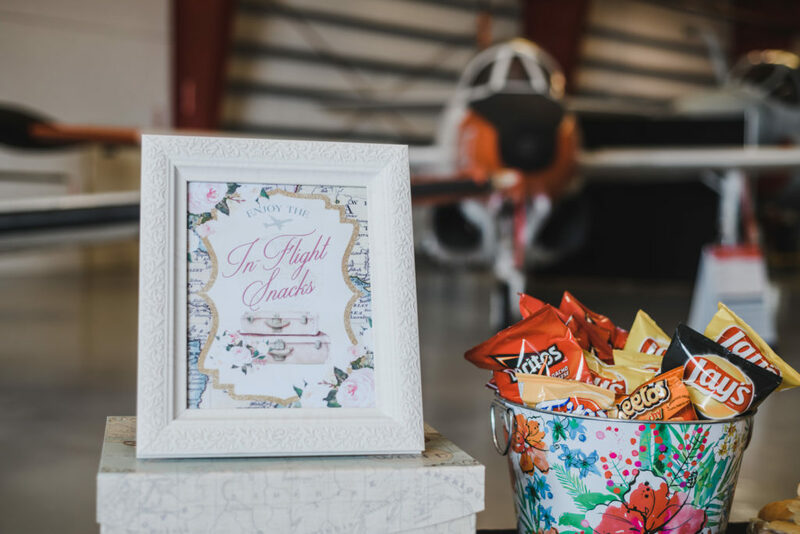 From boarding pass invitations to suitcase party favors this unique shower, held in an actual airplane hanger, is sure to inspire your next party planning adventure as well! 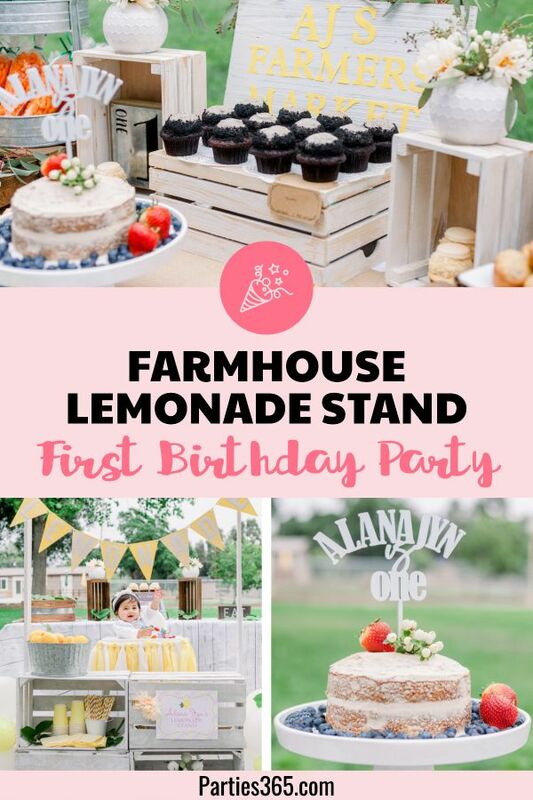 If you want to throw a baby shower that will have your mom-to-be over the moon and wow your guests, all you need to do is follow what you see here! Seriously – don’t reinvent the wheel – just take this adorable theme and run with it! 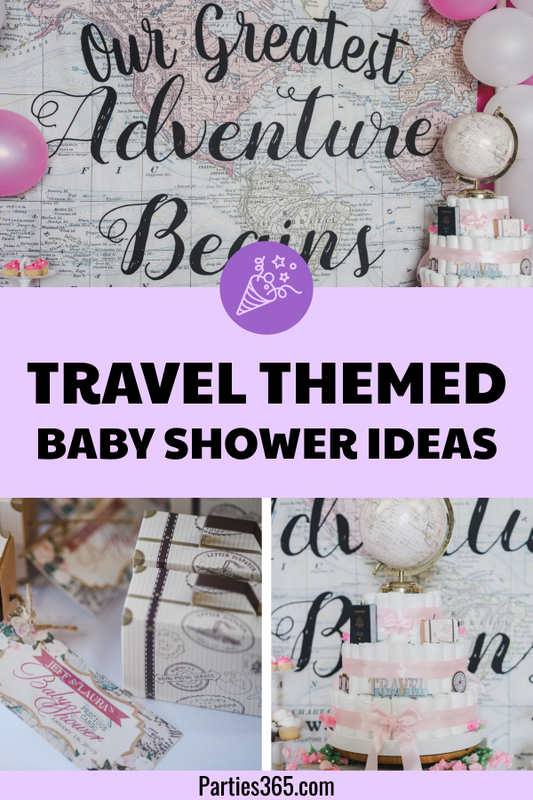 Read on for decor, food and activity ideas that will make your next shower, one to remember! 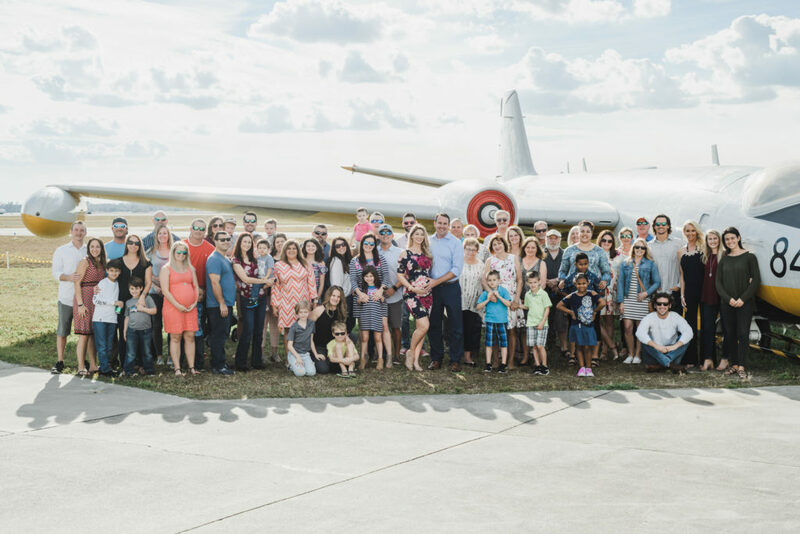 Eagerly awaiting the arrival of baby girl Lily, mom-to-be Laura and her husband Jeff, celebrated their grand new adventure in style! 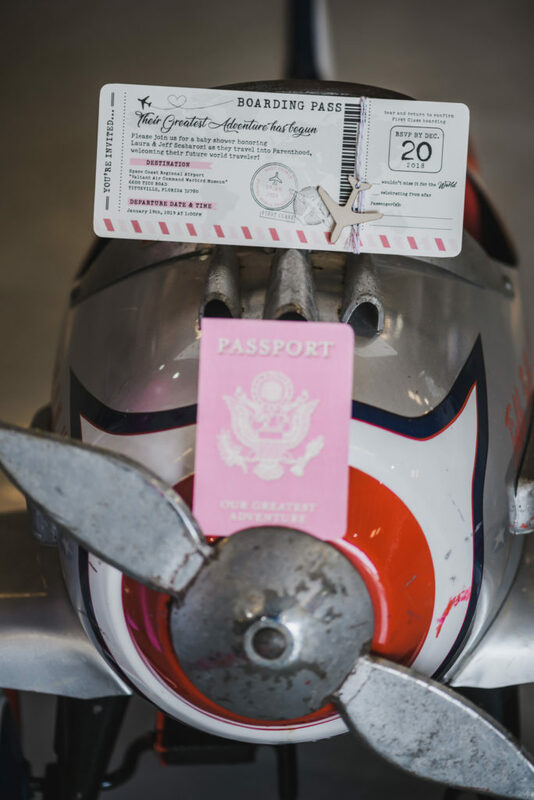 Setting the theme for the party with personalized passports and boarding pass invitations which you can see below, guests arrived at the Valiant Air Command Warbird Museum, home to vintage aircrafts, where the shower was held in one of the airplane hangers. 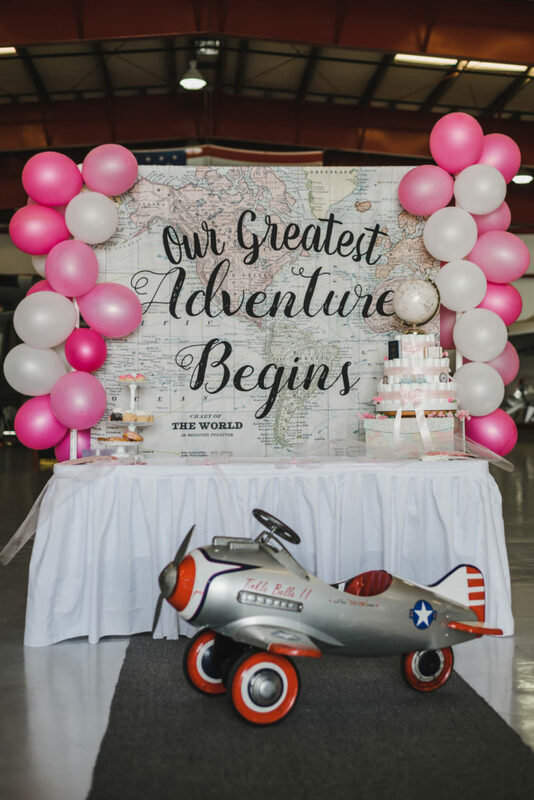 Upon arrival, guests were immediately drawn to the feature table which was highlighted with pink balloons and a large vintage map of the world that read “Our Greatest Adventure Begins!” And you better believe little guests adored the tiny airplane they got to “fly” around the hanger! 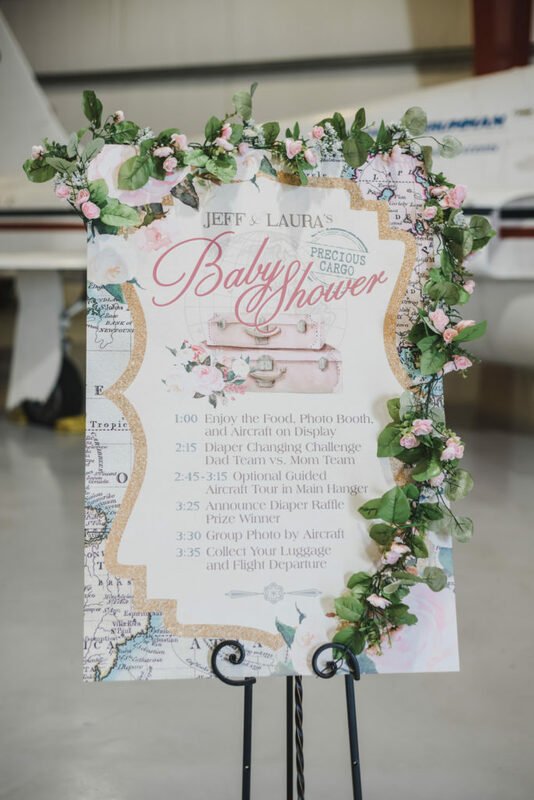 You’ll see the use of clever language in all of the signs and decor in this shower, like the Welcome Sign that highlighted a timeline of the shower’s activities. 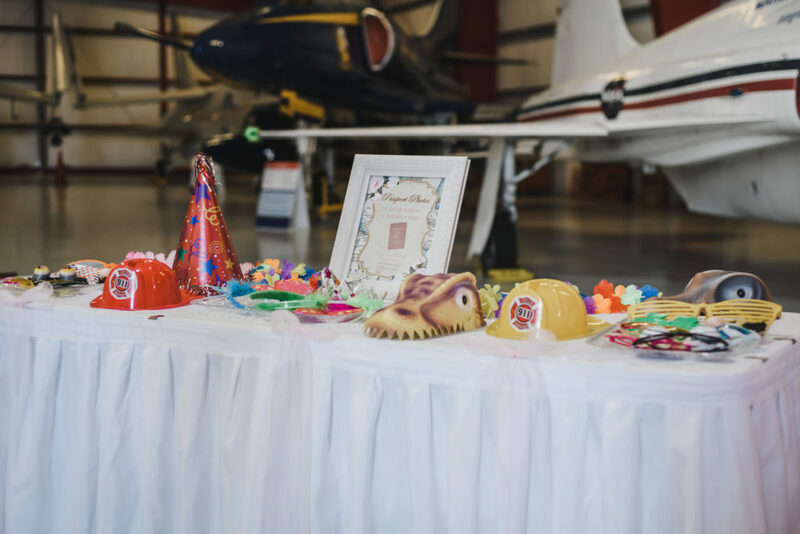 A travel themed party really easily lends itself to playful ideas… precious cargo, passport photos, luggage, in-flight snacks… it’s a wonderful opportunity to let your creative juices flow! 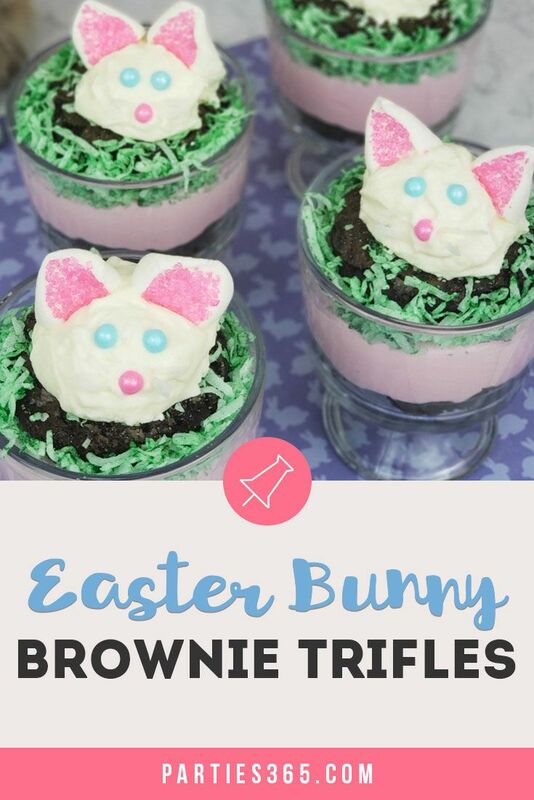 At the end of this post you’ll find some resources for easily recreating this look on your own! 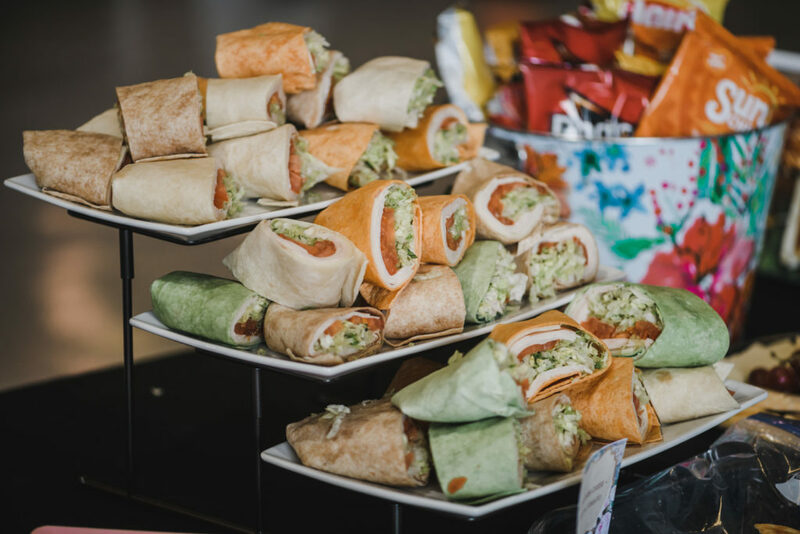 This baby shower was held in the afternoon, so a heavy meal wasn’t necessary, but plenty of delicious bites were available at the Fueling Station and In-Flight Snack Bar! 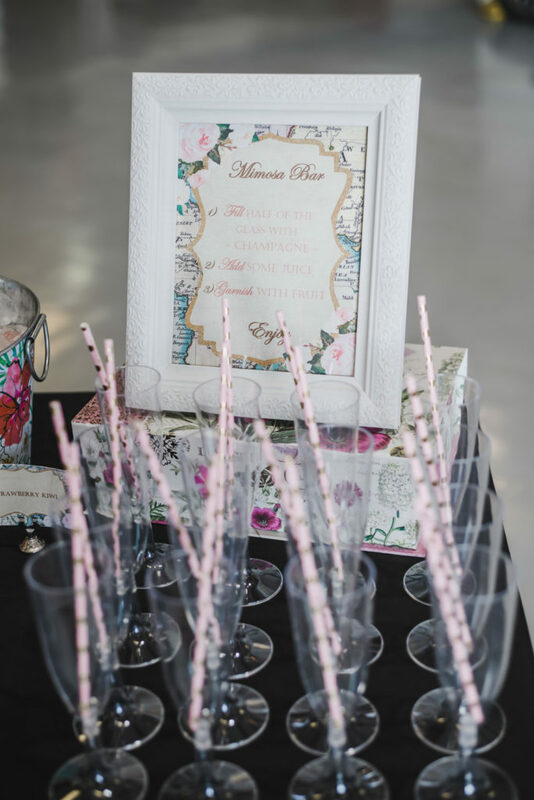 You’ll notice this adorable set of vintage map signs throughout the party, which brought in a little bit of fun and whimsy. 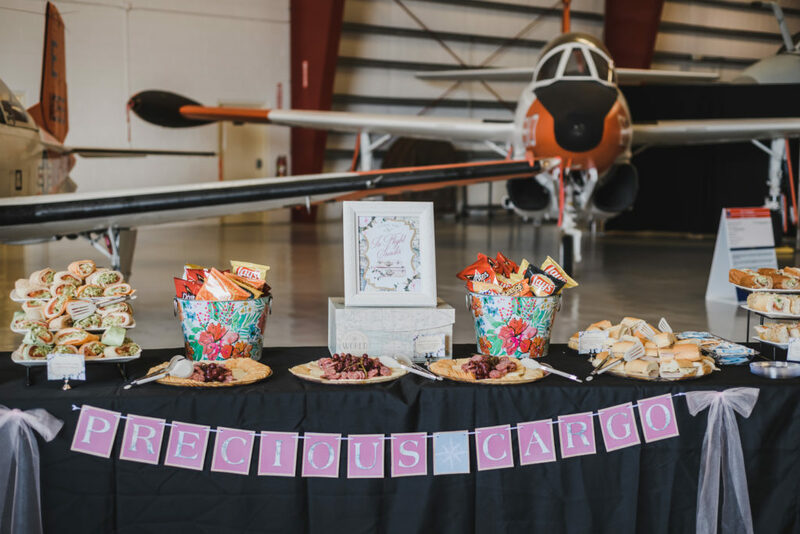 We just love this pink “Precious Cargo” banner hanging on front of the snack table, don’t you? You can find the same one on Etsy in this shop! 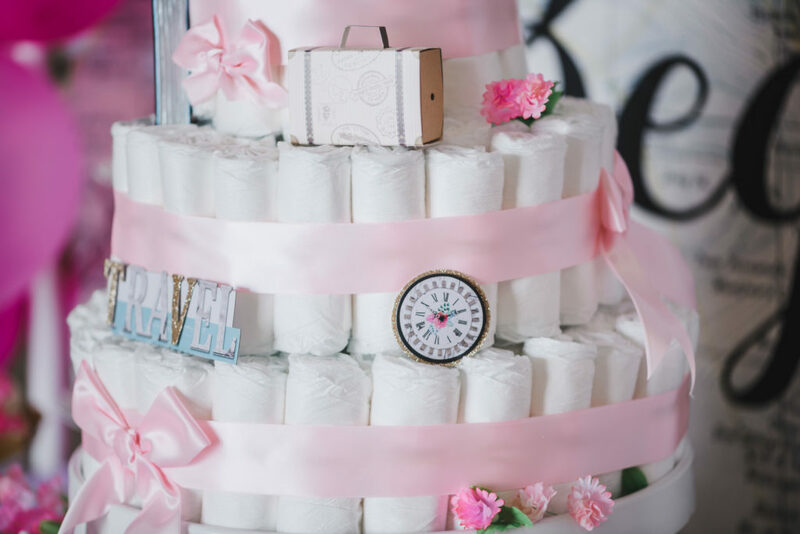 What’s a baby shower without a diaper cake?! 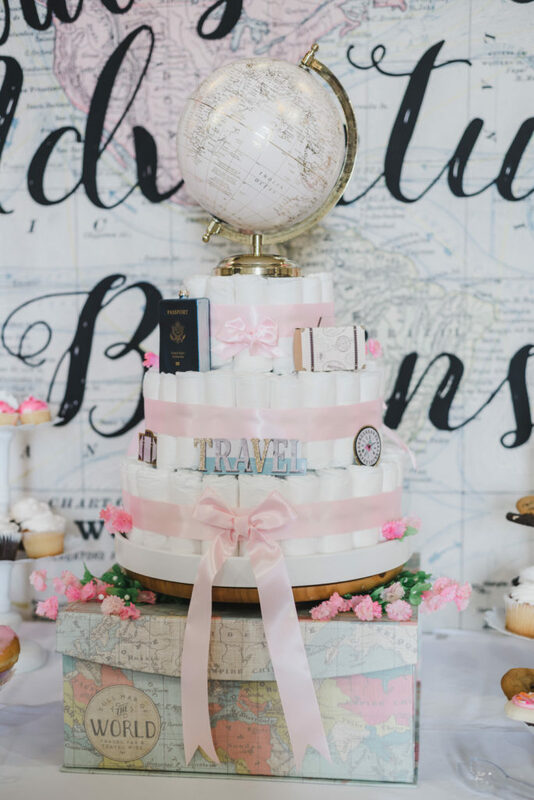 This impressive travel themed diaper cake was decorated with small travel items such as a passport, compass, and luggage, as well as a globe! 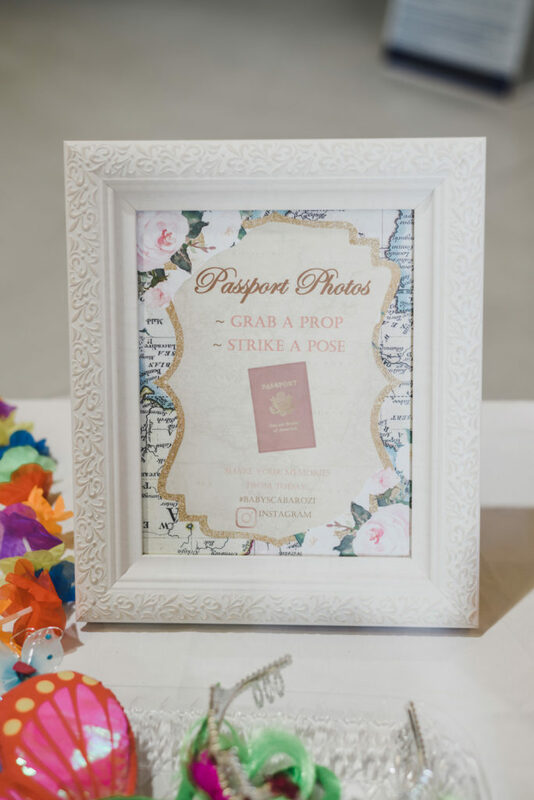 Guests of all ages also loved the “Passport Photo” Booth at the shower! 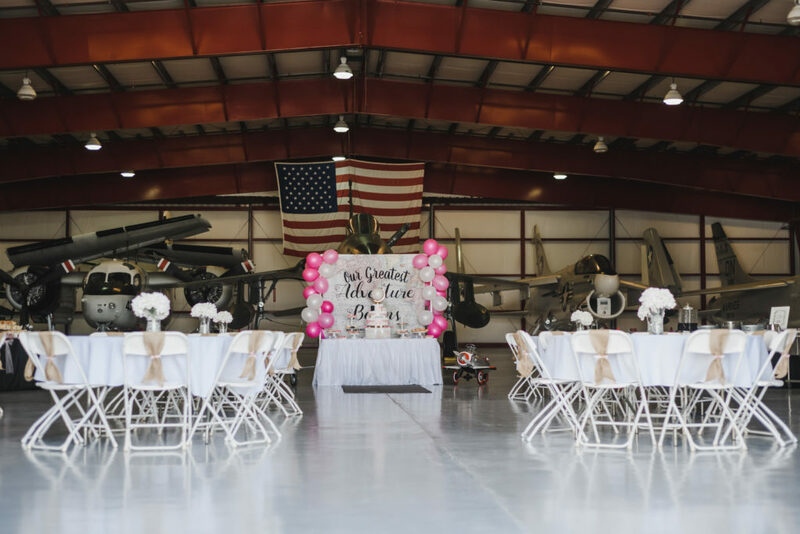 A full table of photo props gave everyone tons of fun choices and the beautiful floral backdrop lined with pink balloons helped everyone create memories that will last a lifetime. And you have to have a game or two at a baby shower, right? 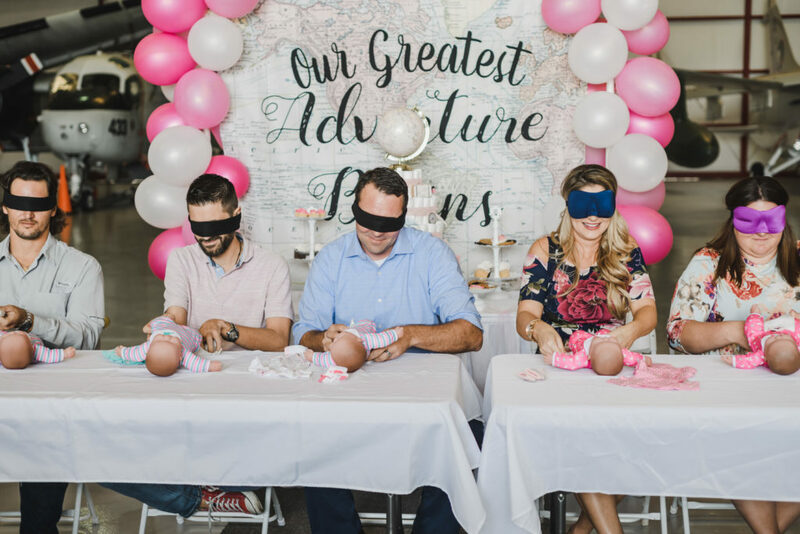 In addition to guessing how many Hershey Kisses filled a giant baby bottle, Laura and Jeff teamed up with some friends to see if the men or women could dress their babies first – while blindfolded! Laura’s team were firecrackers and won the game, but Jeff was faster than Laura and made sure she knew! 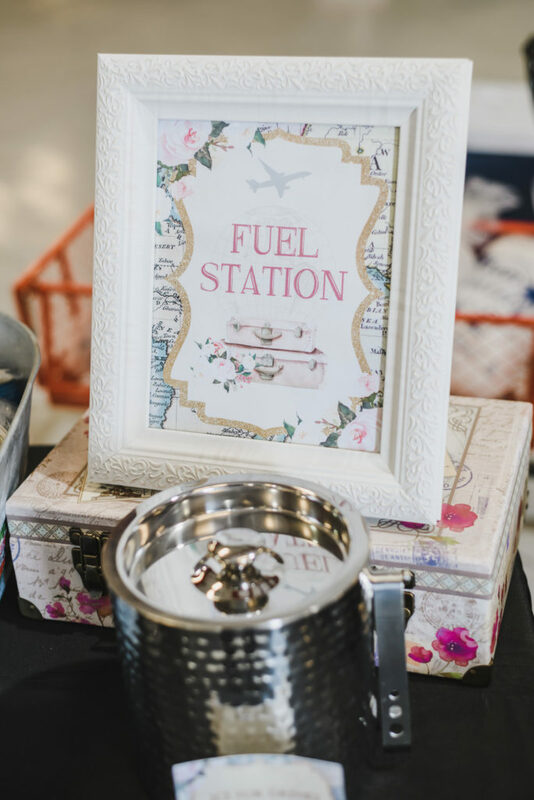 Before leaving, each guest stopped by Baggage Claim and grabbed a miniature luggage favor box with a custom thank you tag. 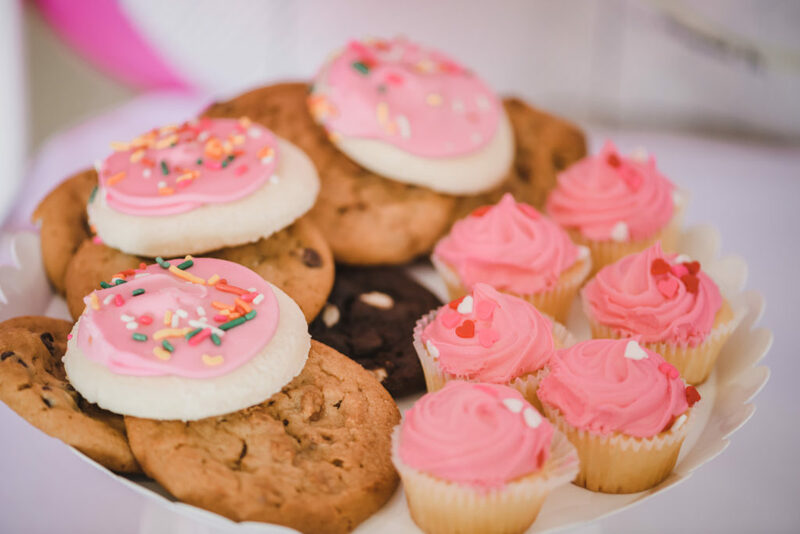 These are adorable and you could fill these with candies, small cookies or some other sentimental keepsake. 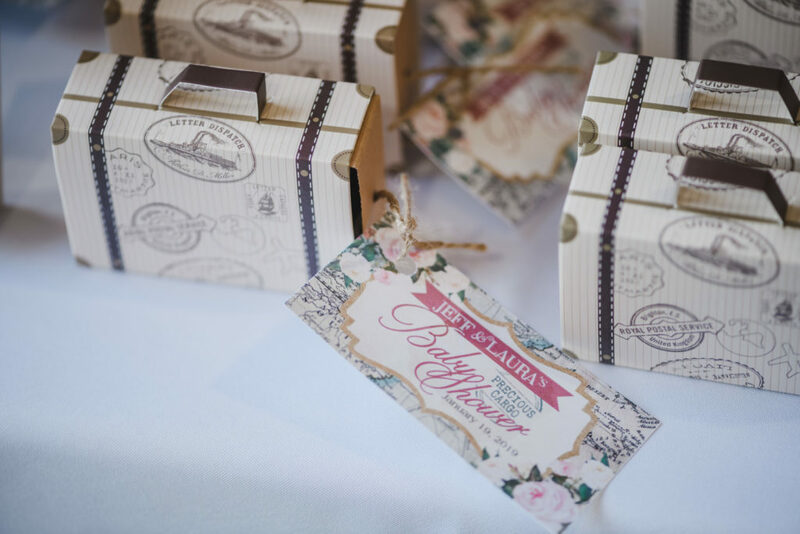 You can find a set of luggage favor boxes just like these right here on Etsy. 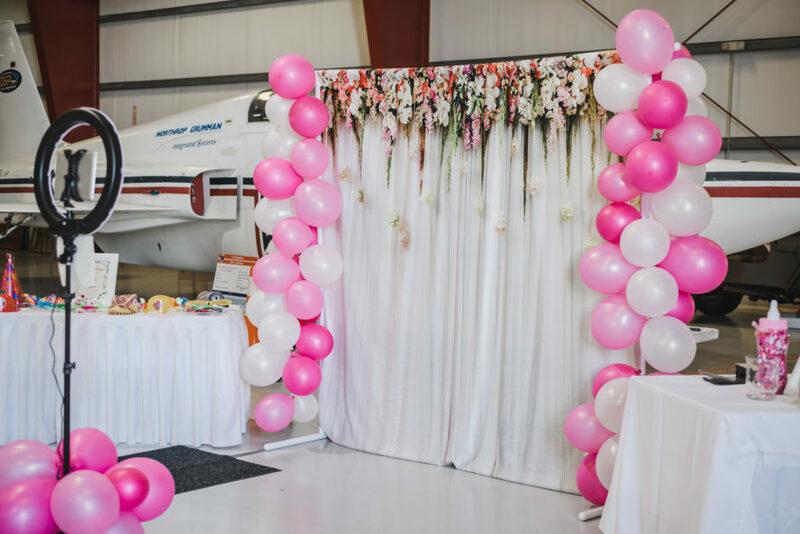 We hope you’ve been as inspired and captivated as we were by this one-of-a-kind travel themed baby shower held in an airplane hanger! 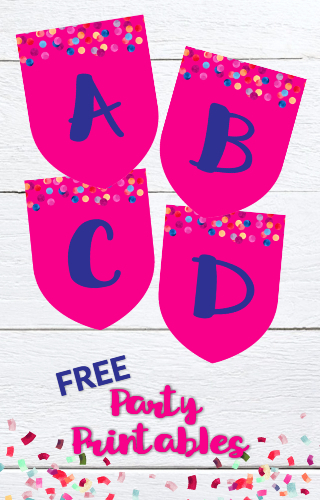 Pin this post for later party planning for your next BIG adventure! 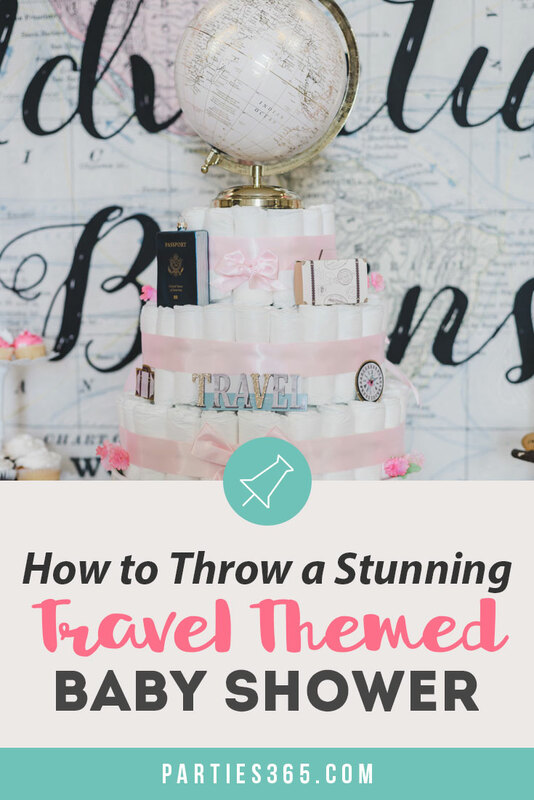 Want to Recreate this Travel Themed Baby Shower Yourself?